Game Preview: Matt Brassard and the Oshawa Generals @ Barrie Colts. #OHL - Very Barrie Colts | A website covering the Barrie Colts of the OHL. Tonight, Matt Brassard returns to Barrie with the Oshawa Generals for the first time since being traded by the Colts. Barrie VS. Oshawa this season. Tonight’s meeting will be the second of four this season. The first meeting took place October, 9th at the General Motors Centre in Oshawa. Oshawa got the 4-2 win over the Colts in what was a special game. Special team wise. Barrie had 10 power play chances and were not able to score a single goal with the man advantage. Oshawa got 8 looks on the PP and Mitchell Vande Sompel got the only goal. Despite having so many man advantages, Barrie was only able to generate 28 shots on goal. Nothing really to boast about. The team maintained puck possession and won a good portion of the draws (42 of 75) but that didn’t help them generate scoring chances. Mitchell Vande Sompel was named the games first star scoring a pair of goals for Oshawa. He put 8 shots on goal and finished the night a +2. Anthony Cirelli also had a strong night for the Gens assisting on two goals. But, I don’t think he will cause any problems for the Colts tonight. Jason Willms and Adrian Carbonara got the goals for the Colts. Anthony Stefano got an assist and got 7 shots on goal. Giordano Finoro was outstanding in the face-off circle winning 12 of 18 draws. David Ovsjannikov got the start for the Colts and made 21 saves on 25 shots faced. New Years Day saw the Oshawa Generals beat the Ottawa 67’s 4-1. Oshawa out shot Ottawa 49 to 33. The 67’s had 7 power play chances but were unable to score on any of those opportunities. On 4 man advantages the Gens were able to score a power play marker. Joe Manchurek scored the game winner late in the 2nd period. Kenny Huether scored his 10th of the season for the insurance goal while Mitchell Vande Sompel scored his 16th of the year to complete the 4-1 win. Jeremy Brodeur started for Oshawa and made 32 saves. The Generals are 5-4-1-0 in the last 10 games and hope to win tonight to extend their lead of the East and pull a little further away from the Peterborough Petes. Owen Sound Attacked the Colts. Owen Sound beat the Colts in their last game 5-1. Barrie was heavily out shot 39-23. Barrie had 7 power play chances and couldn’t score once. They also allowed a short-handed goal on two penalty kills. 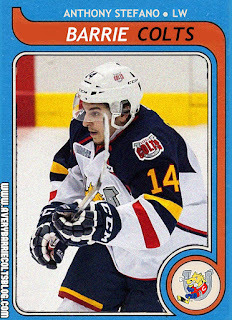 Lucas Chiodo got the lone goal for the Barrie Colts. The goal was his 12th on the season. Cam Lizotte got the only assist on the goal. Ruan Badenhorst got his 2nd start of the season in the loss. He made 34 saves on the night. Barrie has lost 3 straight and have only 2 wins in their last 10 games played. They sit in last in the league and trail the IceDogs by 5 points. The Colts do have 2 games in hand an with a pair of wins could be within a point of them. Niagara has 29 points. We could get into all the ways to breakdown this game but let’s be honest, most of you will be watching the Canada VS. USA Gold Medal game tonight at the WJC so LET’S GO CANADA! Keys to Success: The team needs to find a way to generate more on power plays. They have also been getting heavily out shot. Barrie will need to find a way to get pucks on net, especially with the man advantage. The team could pull off the upset tonight but it wont be given to them, no matter how many looks they get on the PP. Puck drop is set for 7:30 at BMC.